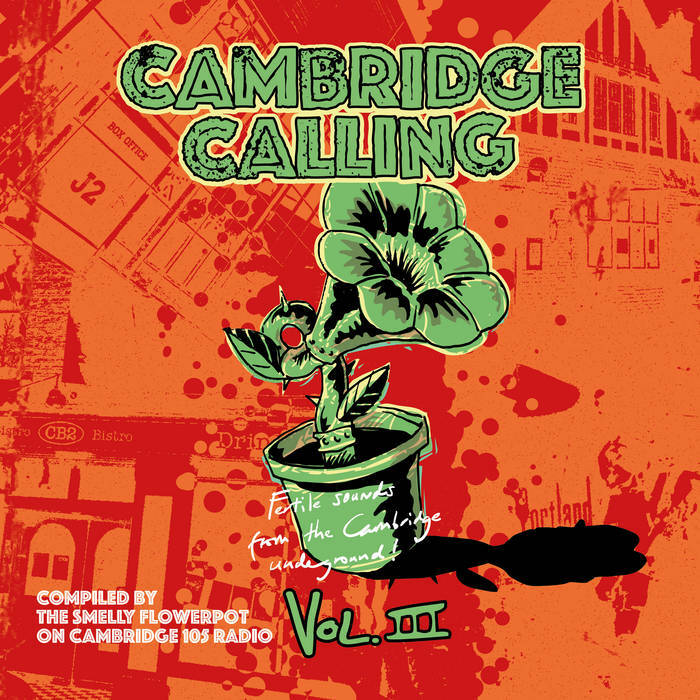 The third volume of tracks reflecting the variety of the Cambridge music scene, expertly curated by DJ Dave Hammond to keep the restless listener guessing. The proceeds from this release go to the local branch of mental health charity MIND. 1. Ember Rev – The Fear Thoughtful opening track, interesting rhythm and guitar lines underpins a lyric of paranoia and warning. 3. Goddammit Jeremiah – Can I See You Being a fan of minimal DIY pop I was very pleased to find this one; 100 seconds of lovelorn low-key longing. 4. Lemondaze – Tremelo A pounding psychedelic excess of creativity from this superb live quartet. Even the quiet bits are loud. 5. The Fifths – Chance It One of the catchiest tracks, full of spiky guitar, rhythmic sharpness and once I realised they were saying ‘..FYI..’ it all made perfect sense. 7. Jessica Law – Find Me In Hell Theatrical prog-folk tale, full of curious imagery, 70s instrumentation and topped with a soaring, haunting vocal. Unique and brilliant. 9. Blue Alatar – Eesabigguntho Hefty, complex instrumental with multi-layers of guitar effects always returning to a mighty main riff. 10. Grieving – Brian Emo Fast blast of US influenced rock with a strong hookline and twin guitars roaming all over the compact track. 11. Eeyore – Out Of Sight I nearly blew out my car speakers when this introduction got going, this is a grinding, stately slice of proper metal and goes a bit Thin Lizzy too when it speeds up, then closes with a spoken section. Good stuff. 12. Section 3 – Danger Zone Bluesy, busy up-tempo rocker with a haunting guitar line counterpointing the punchy bass and drums. 13. Crackleford – Playhouse Well-structured pop song, a variety of keyboards transport it between the sixties and the eighties with a satisfying result. 14. Romy Gensale – The Garden Where No Flowers Grow Despite the barren title this is a lush, verdant moody jazz piece, coaxed along by gorgeous saxophone and Hammond organ. Romy sings in Italian and English, it is an intoxicating seven minute treat. 15. Honeywitch – What People Say Pure acoustic folk, with mandolin and guitar interweaving in the mix around the distinctive, timeless vocal. 17. Manic Mannequin – Hypnotic Big grungy rock ballad, each instrument an equal driving force and with the deadpan vocal delivery making the chorus stand out. 19. Self Love – Faith-Bliss Another confident duo, with a frenetic, explosive wall of fuzz guitar and unforgiving drums. The sinister vocal gives way to an extra instrumental finale. 20. Moody Swing Things – Cuthbert’s Head A hidden gem at the end and the best title on the album; a surreal lyric sung with intense desperation over a riff that pays tribute to the Kinks via the Stranglers. 21. Fay Roberts – Sedna A soothing end to the album, storyteller and musician Fay relates a semi-mythical spoken word tale with some ethereal background voices and timeless themes. This entry was posted in Music on September 1, 2018 by iknoweno.